LG and Google haven't even managed to ensure enough supply of the Nexus 4 Android poster child, and rumors about the next generation already started leaking from Korean forums. This should tell you that the next Nexus 5 is again claimed to be an LG affair, but come with a 5" Full HD screen (surprise, surprise), the new NVIDIA Tegra 4, 2 GB of RAM, 13 MP camera, as well as 3 MP front-facer, and 8 or 16 GB of storage. The price for the 8 GB versions is said to start off at $299, like the current edition. Not only that, but the rumor mill spat out the next Google tablet, informing us that it might be a Nexus 7.7 this time, with a higher 1920x1200 resolution (294ppi), Tegra 4 again, 8 GB of starting storage, as well as front and rear HD cameras. Interestingly enough, the manufacturer mentioned here is again LG, whereas it was Asus doing the Nexus tablet gear for 2012. LG demonstrated a 7-incher with this resolution at CES last week, so this Nexus tablet is certainly plausible. After all, at CES LG's Senior Vice President James Fisher said: "Through our collaboration with Google, we launched the LG Nexus 4 smartphone. This is the first of many devices to come from our growing partnership with this very selective company." Two rumors that are not hard to believe at all, given the 2013 hardware trends, and the source claims these will be announced at the Google I/O conference in mid-May, alongside the next Key Lime Pie Android 5 version that is expected there too. Nexus is tough nut to crack for OEMs, a lot of conditions are attached like high specs low cost, and GG control the design. And the benefits of making a Nexus is early access to latest version of Android now is reduced greatly that GG makes those versions available to all OEMs. Besides Sony is also a very proud company so I don't think they will make a Nexus any time soon. About HTC its strength is design which GG does not need as GG is very good at design themselves, and HTC does not have deep pocket to make cheap devices for GG, so I don't see HTC will soon make a Nexus either. it's the same comparison between the Optimus G and the Nexus 4. i think they compliment each other more than they cannibalize each other. I'm sick of this massive phone crap. 5" is TOO DAMN BIG. On that note, the Sony Z looks like an attempt at producing a Nexus phone. It has similar lines to the LG N4, - clean buttonless front, clean glass back, exceptional hardware all suited for future versions of Android. Sony probably couldnt make it for $399 though, so Sony has to sell it themselves. The greatest advantage to having a Nexus isn't the early access to Android, as you noted. It's the ability to unbundle oneself from the carriers. 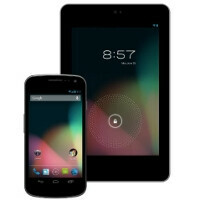 The Nexus is priced at about half the retail price of a comparable device (purchased outright), and is unlocked. So a person can get a MTM plan from any carrier, thus reducing monthly costs dramatically. This also eliminates the bloatware and non-customer additions made by carriers, that people then spend hours correcting, and is a major reason to root a phone. With VZW's and others' use of the government to continue a push to make it illegal for citizens to modify phones that they own, or to move to another carrier, again with a phone they own, the advantages of the Nexus are especially relevant. Sony has tasted blood of "HTC's profit margins on HIGH END Phones" so would not venture into a NEXUS as margins there are pretty low i am sure. Actually, after seeing the final product of the Nexus 4, I wouldn't mind if there wasn't an HTC or Sony Nexus. LG really pulled through on the hardware, and with Google's help on the software, made an amazing product. It's nice to see what LG can do, and they sure did do well. Looking forward to this Nexus 5. However, I still want a Motorola Nexus. Either LG makes the phone and Motorola makes a 10 inch tablet, or vice versa, and I'll be set. If MOT, now with Google at the helm, were to make the new "X" or whatever they end up calling it, with an unlocked bootloader, I would line up to buy it. I love my MOT phone, but I don't like the locked bootloader much. The kernels don't always keep up with the OS changes, as Google seems to be able to put out updates on a regular schedule, then VZW takes months to tweak and approve changes. Motorola usually posts unlock keys or sells special developer editions of their devices. Rumor is the Razr X (that's what I hope they call it), will be sold on Google Play and Verizon, the Google Play version being sold with the bootloader unlocked, and the Verizon version having an optional unlocked bootloader for an extra $15/month. Verizon is putting themselves way too far into the devices and updates. They need to back off a bit. Agree, keep the same size of N7 and add bigger better screen. N7.7 will compete directly with iPad mini so there will be lots of fun. it's doesn't matter, Android is way better than iOS for the tablet to be affected by such accusation. peple will think that GG takes the fight to iPad mini. In average (non-techgeek) users point of view, 7 inch tablets on android (and playbook) did not sell well during 2011 thanks to Steve job's ridiculous speech towards 7inch tablets... In 2012, only nexus 7 and kindle manage to sell well, until then Apple makes iPad mini... If 2013, Google makes exactly same bezel as iPad mini, average user will misunderstood themselves that, android needs inspiration from Apple to survive... that will make iPad as leader and android as followers... Did you get a clear picture? You know why N7 do not sell well? N7 is mostly sold through Play Store as GG wants to use N7 to attract people to Play Store. Lacks of wider distribution hurt N7 sales. Why Apple makes mini? They see the success of Android 7" tablets so they had to react. Selling mini at low price (for Apple) reduces its profit but Apple has no choice. lol, small bezels is only 1 small detail of design, and that's not Apple's invention either. Overall N7 is very different from mini so there's no problem. N7 form factor is so good (you know that yourself don't you) so I think Google should keep it. Android is designed to deal with vast array of screen sizes and resolution and all apps have auto scaling features and developers dont't have to worry about that. Quantity, SS? You know that N10 is made by SS and it has supply problem as well. Supply issue is GG's fault, not LG's or SS's. GG subsidize the Nexuses to lure people to Play Store and they can't afford to sell many N10 or N4 as they are losing money selling them. And I don't know why you think SS can do a beter job with Nexus than LG? The experience with GNex and Nexus S was not good while people are very happy with N4. How is it not Lg fault about supplies their making the device not google. If it was moto making it then its google's fault. And you know google wasn't making planning on make money off the nexus. Google makes it money off Ads. And at least Samsung had supplies to keep those devices in stock. You know what? there is a thing called CONTRACT, Google place an order, if LG can't fulfill the order there will be consequences so it's not LG for sure, otherwise GG can take LG to court. "Samsung had supplies to keep those devices in stock" - you mean Nexus 10? Samsung already made a 7.7 inch tablet, around 13 months ago.